Looking for something tasty and gluten free? Gluten free bread is dense, it crumbles and goes stale too quickly - right? Not any more! Gluten free pastry is heavy, thick and difficult to work with because it breaks up when you life it. No, not with our pastries. Plain and flaky pastries that work every time. You will find most of these recipes and many more in the RecipesforLiving store. The store is located at RecipesforLiving.Etsy.com to provide customers with the security of buying through a professionally developed and managed online shopping system. When was the last time you enjoyed a real flaky pastry? You can see the layers of pastry in this photo. Quinoa flaky pastry is light and flaky. It is surprisingly easy to make and can be used in all the food you would usually make with flaky pastry. I use it for savoury pies, fruit pies, sausage rolls, anywhere I need a reliable flaky pastry. Another artisan style bread. Like other artisan bread I am developing, it uses only a little bakers yeast, and relies on bread making techniques to deliver a tasty, enjoyable bread. Spiced with cardamom, cloves and ginger, Spiced Millet & Currant Bread was designed to be baked as a free-form loaf. The techniques are easy to use and are clearly explained in the recipes. As this bread relies on fermenting, more time is required, however the extra time is not "hands-on" time. There is time to relax with a book, go to work, or go to bed, between the stages of making this bread. Millet is an nutrient rich seed. Millet bread is a tasty soft bread that can be used anywhere a regular bread is used. It is pliable and does not need to be frozen. Millet bread will keep out of the refrigerator for a few days. Preparing for your Christmas celebrations and you need a treat that everyone can share? 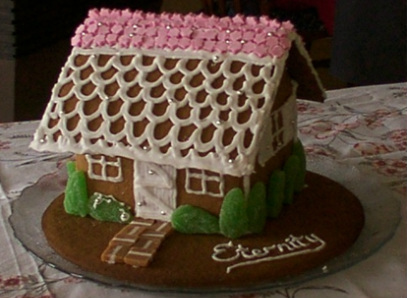 This recipe for a gluten free Gingerbread House comes with plans to cut out or trace. There are two recipes for gingerbread, both provide a tasty gingerbread. This recipe uses a simple approach that produces tasty and nutritious pasta. I use home grown, free range eggs to make our pasta. You need a pasta machine to roll the pasta and to cut strips, or, if you prefer you could use a rolling pin to make sheets of pasta for lasagna. This recipe for Handmade Quinoa Pasta makes enough fettucine to serve 4 to 6 adults. Wouldn't it be nice to have a pizza base that isn't brittle, that doesn't fall apart, that you can eat without breaking your teeth. 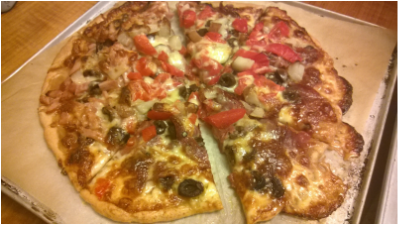 Here is a recipe for gluten free pizza base that works the way pizza base should. With a bit of practice you can even stretch and spin the dough!. There are no gums or industrial cellulose products in this dough. Only a little bakers yeast is used. This pizza dough has an open texture, it is flexible. It is not crumbly or heavy. 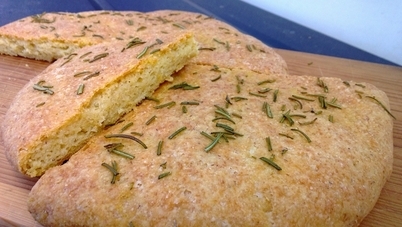 This recipe is part of a new range of Artisan Style gluten free bread recipes. There are no gums or industrial cellulose products in this bread. Only a little bakers yeast is used - a small fraction of what is used in a conventional loaf of regular or gluten free bread. The bread has an open texture, it is flexible. It is not crumbly or heavy. As with regular focaccia, this gluten free, millet focaccia is best eaten on the day it is baked. It is Ok the day after baking and is better if warmed through. This is part of a new range of Artisan Style gluten free bread. In this recipe there are no added starches, no tapioca, no white rice flour, no potato starch or corn starch. The only flour in this bread is millet flour and buckwheat flour. There are no gums or industrial cellulose products in this bread. Only a little bakers yeast is used - a small fraction of what is used in a conventional loaf of regular or gluten free bread. The bread has a close texture, but it is flexible. It is not crumbly and heavy. The heart of this recipe is technique: a simple set of techniques, clearly set out in the instructions. Millet & Buckwheat Artisan Bread takes a little longer to make, but the "hands on" time is still short. The dough requires a little kneading, time to ferment and time to proof. This recipe helps you make a light and light and tasty free-form loaf that will grace your table, and delight you senses. Rice Bread can be made with white or brown rice flour. It was designed to be made as a free-form loaf. Thinking about a BBQ, an easy meal, or just school lunches? These light and tasty Hamburger Buns are from the range of yeast bread recipes available in our store. They are soft, have a definite crust and hold together well for the life of your hamburger! A richly textured bread full of seeds, and flavour. Sorghum Multi-seed bread has a complex flavour from a special selection of gluten free seeds. This bread is dairy free and egg free. Looking for a dairy free, gluten free, pastry that is tasty and is easy to make? This Buckwheat Pastry might just be what you are looking for.